Ryan Gosling. Emma Stone. Rosemarie Dewitt. John Legend. BAFTA (Best Male Lead). Music. BAFTA (Best Direction). Comedy. BAFTA (Best Film). Drama. Oscar (Best Director). BAFTA (Best Female Lead). Musical. Oscar (Best Female Lead). 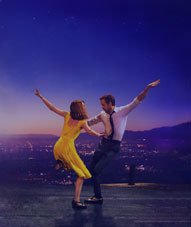 Winner of 6 Academy Awards(r) including Best Director for writer/director Damien Chazelle and winner of a record-breaking 7 Golden Globe(r) Awards, La La Land is more than the most acclaimed movie of the year - it's a cinematic treasure for the ages that you'll fall in love with again and again. Emma Stone and Ryan Gosling star as Mia and Sebastian, an actress and a jazz musician pursuing their Hollywood dreams and finding each other in a vibrant celebration of hope, dreams and love.